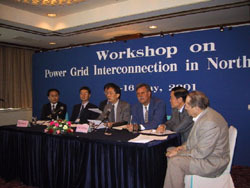 The first workshop of the Northeast Asia Power Grid Interconnection project (Grid project) was held in Beijing from May 14 through 16, 2001 in collaboration with the State Power International Service and the Electric Power Research Institute of China. Power system experts, electrical engineers, economists, and energy policy researchers from all countries in the Northeast Asian region along with representatives from the United States and Europe discussed various aspects of power grid interconnection and electricity trade in the region. The aim of the workshop was to provide a forum for sharing of current research related to regional grid issues among workshop participants from the region, as well as to create an opportunity to hear the perspectives from individual countries toward potential grid interconnections. The workshop also played a role in providing a foundation of technical training and background for regional researchers on technical issues associated with grid interconnection.